Our professional crews have extensive experience in a multitude of rock fall drapery, debris flow barriers, and wire mesh installation. We specialize in the mitigation of rock fall for rock faces and soil slopes. We provide qualified, able crews for any and all scaling needs. With over 30 years combined experience, our teams provide expert advice and deliver superior services. TRIPTYCH Construction, LLC, centrally based out of Douglas County, Oregon, provides specialized construction services for the commercial, industrial, public works, government and institutional markets. Our company is fully bonded and insured, and we are currently licensed in Oregon, Idaho, and Washington. We are a Certified Tier1 Emerging Small Business, and SBA HUBZone Certified. We have over 30 combined years of experience in Rockfall mitigation. 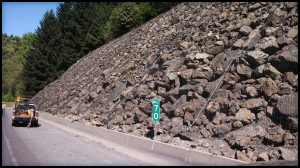 We specialize in rockfall safety problems on highways, railroads, dams and more. 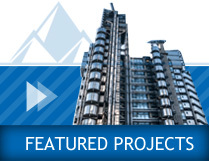 Our trades people, project managers, jobsite leads and office personnel are experienced, knowledgeable and skilled at working with engineers, general contractors, architects, building owners, geologists and government inspectors. We have the ability and expertise to manage large or small commercial projects on time and within budget. We pride ourselves on being safe, agile, adaptable, and passionate about our work while providing quality service at affordable prices to our customers. Our values and work ethic set us apart from the rest. We thrive on tough challenges and we truly care about your success. Feel free to take a look around and/or contact us to learn more about our company, what we do and why we are the best fit for your project.